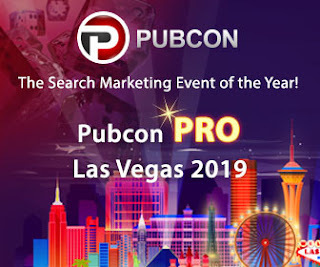 I've been acquainted with Brian Massey, The Conversion Scientist™, for quite some time though his speaking at PubCon and following him on Twitter. He's a sharp guy with some great ideas about how to make websites work better to create customers from visitors. When I heard he had a book in the works, I knew I wanted to check it out. 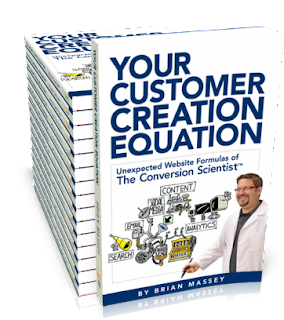 I recently received a Kindle version of Brian's book, Your Customer Creation Equation: Unexpected Website Formulas of The Conversion Scientist [Amazon Affiliate link] and I was not disappointed. It's a work filled with great methodology on how to measure what's happening on your website and how to make adjustments to help you can gain more customers. While there is a certain amount of "step-by-step" instruction, it's flexible enough that just about anyone can use the knowledge gained and work out a plan which will help them make their website a conversion machine. Measurement is all-important as you work through doing anything with a website. The first two chapters of the book cover this topic in great detail, allowing one to create a "Digital Conversion Laboratory" in order to carefully and accurately measure the results of any changes made to websites. Because there are more types of sites than just those which sell products or services, I also like the fact that he breaks websites down into 5 different types. He even goes into some instruction on how the brochure site, the publication, the online store, the consultative site and the online service work and how each method of optimization works on those types of sites. He even covers situations where a site may have elements of more than one type. "Marketing speakers and authors Bryan and Jeffrey Eisenburg are fond of saying, 'You can't read the label from inside the bottle.' It is hard to look at your own business objectively, so it helps to look through the eyes of your prospects and customers." - To which I say, "Yes!" It's important to get someone from outside your organization to check out your website(s) from time to time. It helps eliminate the myopia we sometimes get looking at ourselves. Related to the point made above: "It's important that your content be organized intuitively for both new and returning visitors. By 'intuitively' I mean your visitors' intuition - not yours. ... It is the visitor's frame of mind that counts." - This is so true. We often design websites according to how we organize ourselves rather than how customers might see us. Again, we have to step outside ourselves and see what they see. "One of my mantras is that 'specificity is a hallmark of conversion.' - If you want customers to do something, give them a clear call to action. If you leave them guessing, they will 'guess' to another site." Brian covers this in much detail in the book. "The choice is simple: Listen to your wallet or listen to your ego. Your accountant will know better than your designer whether your site is performing." Related to the first two quotes above, this is very important. Ego is a killer of conversion and good site design. Once more: Get outside yourself (or your organization) and learn how your customers see you. From the "You Learn Something New Every Day" Department comes the tip about the Google Analytics Application Gallery. I don't know how I missed this before, but I know about it now. I already use most of the tools listed there, but there are some which are new to me. "This flies in the face of reports and research that says surfers don't read. The truth is that web surfers don't read content that is crappy, colorless, tasteless and irrelevant." - True, true, true! I've never been a fan of those huge hero images common to most web sites these days. Brian has some thoughts on those, as well: "The motion of the [rotating big hero image] - also called a slider - causes the reader to stop scanning the page and look back up. Almost every test I've seen on this is clear: rotating banners reduce conversion rates." I also don't like the fact that they push so much of the real content "below the fold" on most sites. The most important lesson: "The data will tell you stories you may find hard to believe." - So true. It's amazing what you can learn about your website by looking at the analytics data. Some surprises may be good, but some may be quite bad, too. All in all this is an excellent book which I recommend to anyone who is looking to increase the effectiveness of their website - regardless of what type of site it is and what is/are the goal(s) of the site. 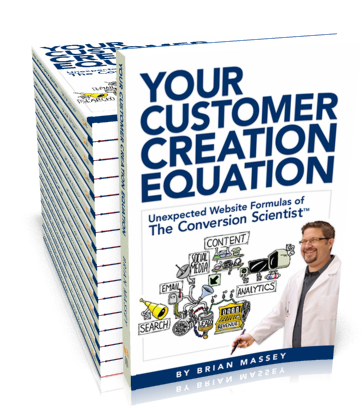 Your Customer Creation Equation: Unexpected Website Formulas of The Conversion Scientist by Brian Massey [Amazon Affiliate link] - Practical knowledge for anyone running a website. Disclaimer: Even though I received a copy of this book at no cost to me, this is my honest opinion of the work.